Tax resolution services and tax debt relief help. Hire our team to help and deal with tax debt problems like tax levy, tax lien, wage garnishment, and more. To get some relief from the IRS for about six months or longer, you need to file for hardship and meet the requirements for such. You will need to submit detailed financial information about yourself with the IRS, so it can be determined if you qualify for status 53, or in other words, you are considered uncollectible. The granting of this status is not to be taken lightly because the IRS doesn’t just hand this out easily. The IRS must be convinced that you qualify as uncollectible, and it would create too much of a financial burden on your present situation if they were to enforce such a collection. The tax collector in charge of your case can file this status 53 because only collectors or IRS officials are authorized to do so. You may be granted a reprieve to file additional paperwork if the tax collector is quite familiar with your financial constraints. But, the collector may have some difficulty filing this status for you unless the proper IRS forms have been filled out indicating this detailed financial information. The forms that need to be filled out to file for hardship are 433-A for personal information and/or 433-B for businesses. Make sure your information are true and accurate. 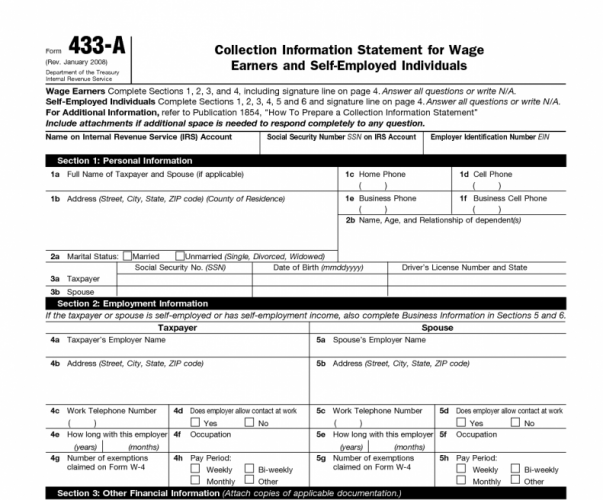 The “Collection Information Statement for Wage Earners and Self-Employed Individuals” is the title for form 433-A. Through this form, the IRS will get an idea of your collection potential. This could mean the difference of collecting from you straight away or giving you some time to get a hold of your financial standing. Your Personal Information consisting of your SSN, dependents, phone, address, housing arrangements, and others. Your Employment Information which details out your employer, pay stubs, work number, how long you’ve been employed, your occupation, and other pertinent information. Your Other Income that comes from pensions, annuities, social security, child support, alimony, investment income, and other sources. Your Bank and Financial Information which probably includes your checking account, liquid assets, investment accounts, credit card accounts, insurance policies, and other financial instruments. It can be challenging to prove financial hardship, but if the requirements are in organized then it can be done. Please consult with a tax professional before attempting to file for uncollectible status on your own. This professional can tactically determine if declaring hardship is the best recourse for you. 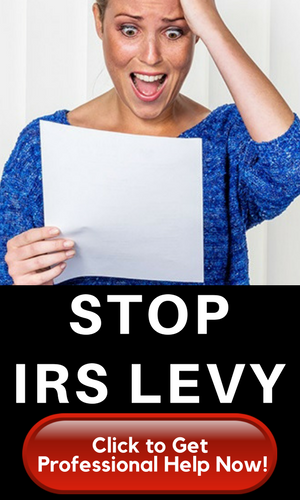 Your IRS problems will not disappear by merely being classified as currently not collectible. This is just an avenue for you to get on your feet so that you are able to settle your pending IRS account when you are able to do so in the near future.